My response surprised her. I can’t say I blame her; when I was her age, I thought of ghost towns as being something like Bodie, California. I expected empty streets expected lots of old wooden buildings with dusty furniture still inside. I expected rusting cars and abandoned equipment and tumbleweeds. You know, the sort of place that where you half expect to encounter the 1960s-era Clint Eastwood around the next corner. Manda, Texas isn’t that kind of ghost town. There aren’t any rusting cars and tumbleweeds, and I didn’t see the Man With No Name lurking about. Even at its height, it was never as large as Bodie; the Handbook of Texas indicates that it may have peaked at around forty at the turn of the twentieth century. At one point it supported a post office/general store, a cotton gin, and a Methodist church. The Texas and New Orleans Railroad even had a switch nearby, though the tracks have been gone so long that I can’t even find evidence of them using Google Maps’ satellite view. It also supported this school, which operated until 1963. 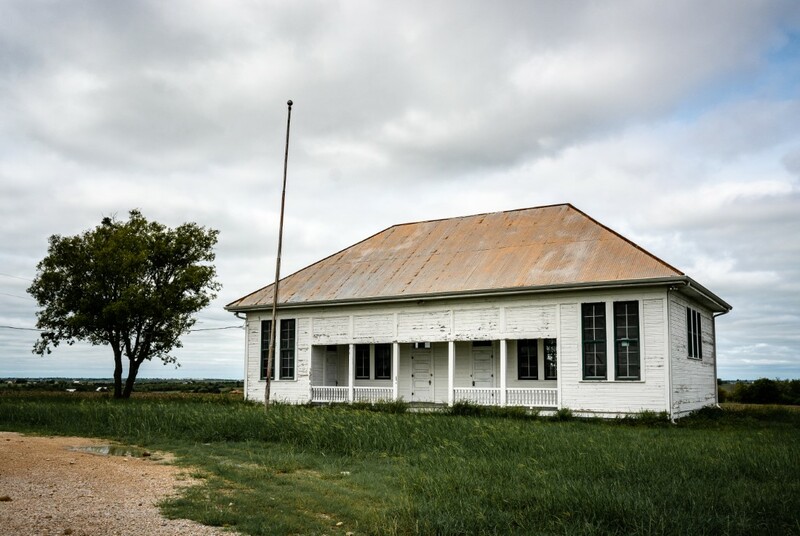 Today this building and the Methodist cemetery are the only remaining reminders of Manda, Texas.